Many professionals would claim to know and utilise the value of the connections in their network. Yet most invest time, energy and cups of coffee in creating a network, only to let it languish on a forgotten LinkedIn account or as a stack of dusty business cards. 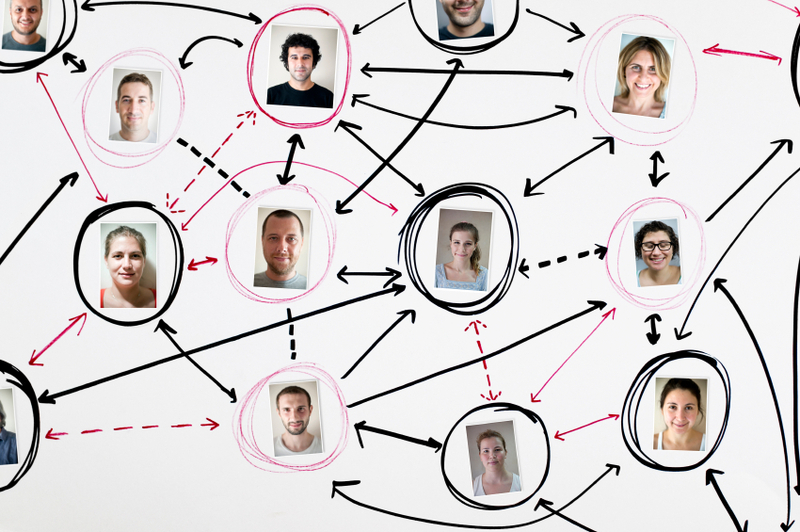 Not all networking is equal and certainly not all networkers are equal. After two years of intensive networking, I’ve developed a schema that outlines how to cultivate a potent professional network. Fourth dimension networking is a concept that empowers you to realise greater benefit with your network. Most business professionals engage in low-impact networking. They meet someone at an event; exchange business cards and basic professional details (i.e. what you do, where you work, what experience and expertise you have); then connect through social media (i.e. Twitter, LinkedIn or Facebook), with some or no ongoing personal dialogue. This kind of networking fails to realise the depth of knowledge, networks and capabilities of the people in the network. Your network is a resource of knowledge and action. It could sit latently with unrealised power, or you could assume leadership to activate the network and catalyse that power. Your network is a collection of people with whom you have a relationship and to whom you can offer your knowledge, experience, skill and contacts. So ask not what your network can do for you, but what you can do for your network? The depth and richness of a network can be defined by looking at its dimensions. Network dimensions encapsulate the depth of knowledge held about a person. Initially, deep networking appears to be a three dimensional concept, where the third dimension reveals the substance of a person beyond a mere name and face. However, there is a fourth dimension to networking that incorporates movement and action, where the capability of people is activated. Fourth dimension networking’s richness is based on how it incorporates action and progressive movement. In this dimension there is purposeful intent to do activity of value to others, to catalyse goodness for and within the network, and to enable doing good with the network. Within the fourth dimension, there are many levels of practical activity for the savvy networker. I have developed a list of value to me. The items below are ranked and the higher numbers have greater value. The levels can be customised and ranked according to personal preference. There is a knowledge management angle to fourth dimension networking: Managing your network with a knowledge focus. 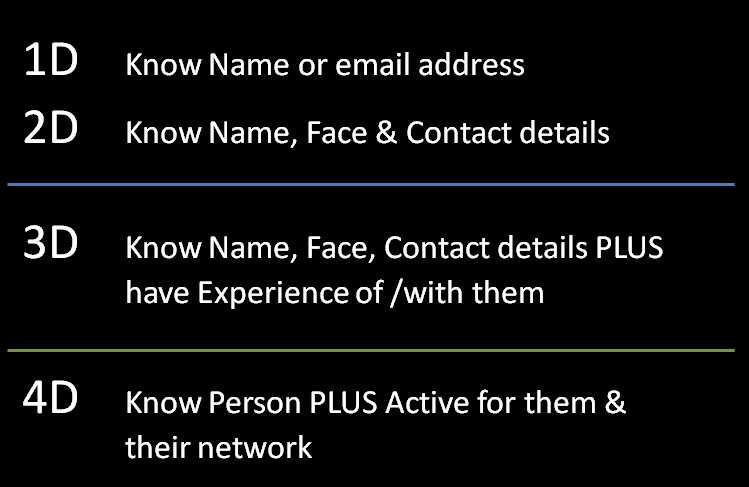 Far more than just an information source, network contacts are a significant resource of rich, contextual and highly dynamic knowledge. The value of that knowledge is unlocked by actions and through relationships that mobilises knowledge for the benefit of all. A network is a rich knowledge-base of many classes of knowledge: what-is; how-to; why-it-is-so; who-is; who-has; where-is; -when-is; what-happened etc. It can be a significant form of social capital where ‘who-you-know’ is often more highly prized rather than ‘what-you-know’. A network can be a vehicle for the creation of personal and collective knowledge, as well as the distribution of knowledge that might be applied more widely. I have consciously and carefully co-created my network so the preconditions for knowledge sharing are more prevalent: trust, respect and rapport through shared values and common frames of reference. Want to ask me something? I may not know the answer but I’ve got about 600 people I can ask instantly who might. I am using this concept to examine my networking practice and the power in my network. In Part 2 of this series, I report on my findings. In Part 3, I share insights about what practices, tools and mindsets are useful for being a 4D Networker. Join me on the journey of improving your networking performance. Spectators and participants both welcome. Helen Palmer is Principal Consultant at RHX Group. She thinks critically about knowledge work, and how to ensure knowledge isn’t wasted. She revels in tackling the big processes of change and learning so that ideas become impact. With her colleagues at RHX Group, Helen helps individuals and teams make better use of their contacts, knowledge and information. This entry was tagged knowing, knowledge, knowledge sharing, knowledge-base, leverage, network, people, performance. Bookmark the permalink.